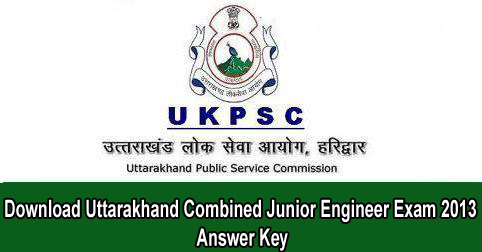 Uttarakhand Public Service Commission UKPSC has released answer keys of Combined Junior Engineer Exam 2013. Answer keys of all four series – A,B,C and D are available now on UKPSC official website www.ukpsc.gov.in. Candidates can check it from 02 Dec to 11 Dec 2015. UKPSC wants to recruit 578 Junior Engineers through Combined Junior Engineer Exam 2013. UKPSC published Admit card on 17 Oct and exam was held on 06 Nov to 08 Nov 2015. Candidates now check answer key of Combined Junior Engineer Exam 2013. Help us to improve this article/job posting "Download Uttarakhand Combined Junior Engineer Exam 2013 Answer Key". We would be glad if you can comment below and provide your valuable suggestions and feedback. If this page have any wrong information/list or out of context content, then you can report us as well.